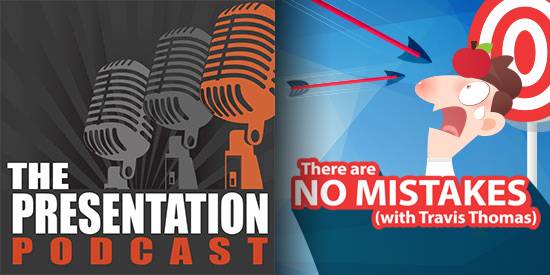 The Presentation Podcast Episode #67 Released Today! Presenting is a skill, an art, an act of being courageous and being the focus to a live audience. But, the secret is, the audience does not know your slides, your talking points or what you are going to say. Join an amazing conversation where Troy, Nolan and Sandy are joined by Travis Thomas, author and improv comedian, as we talk about how presenters, like an onstage comedian, need to continue presenting like there are no mistakes – because the audience only knows it was a mistake if you tell them.